While you’re cooking up a batch of hard boiled eggs to dye, make sure you save some for this delicious twist on classic Easter brunch fare. The curry and herbs add a pop of color and taste. Try them yourself to see! 2. Stir in mayonnaise, lemon juice, curry powder, mustard, salt and pepper until smooth and creamy. Spoon or pipe mixture into egg white halves. Sprinkle with chives. Gently place eggs in single layer in medium saucepan. Add enough cold water to cover eggs with 1 inch of water. Bring just to boil on medium-high heat. Remove from heat. Cover and let stand about 12 minutes for large eggs. (Adjust time up or down by 3 minutes for each size larger or smaller.) After 12 minutes, pour off the hot water and rapidly cool eggs by running them under cold water (or place in ice water) until completely cooled. Refrigerate and use within a week. 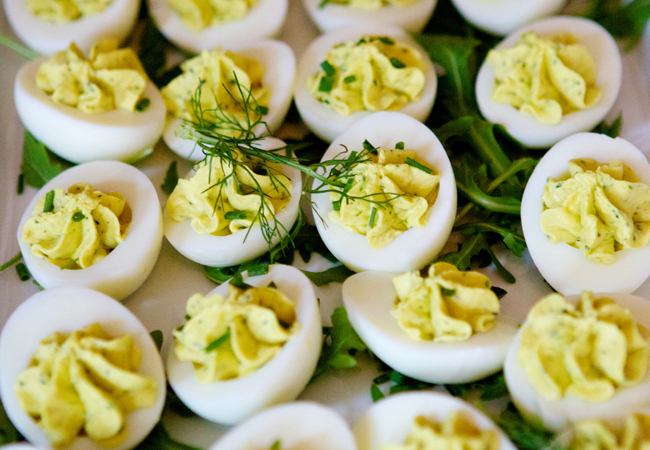 For creamier deviled eggs: Stir additional 1 to 2 tablespoons mayonnaise into yolk mixture.